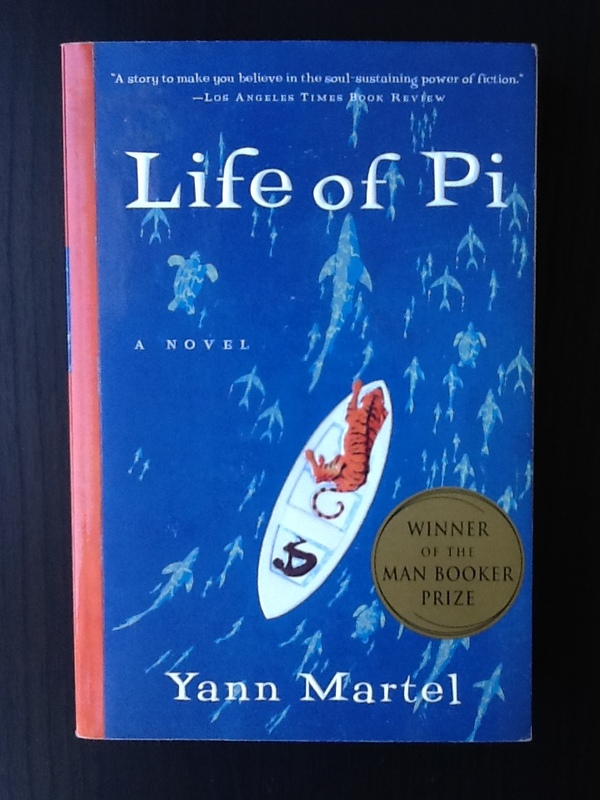 Belief and Life of Pi – The Bookshelf of Emily J. The middle section of the novel is about his family’s shipwreck in the Pacific Ocean. The family owns a zoo and is moving from India to Canada to sell the zoo and to settle their family. However, the ship crashes, and Pi is the only one to survive. He ends up stranded on a life boat with a zebra, orangutan, hyena, and, most frightening, a tiger. This is where the novel gets interesting. It recounts Pi’s days on the ocean and his attempts to survive both the elements and the tiger, for the other animals either kill each other or end up eaten by the tiger, who is named Richard Parker. (Interestingly, Richard Parker is the name of a sailor who suggests cannibalism and then becomes victim to cannibalism in Edgar Allan Poe’s novel The Narrative of Arthur Gordon Pym.) Pi tells a fantastic tale, of learning to dominate the large predator, figuring out how to fish, building a raft for himself away from the boat (and the tiger), and finding a man-eating island. That was my favorite part: the island. It fascinated me. I hope I’m not spoiling the novel for anybody when I say that it ends with Pi washing up on the shores of Mexico and the tiger running off into the jungle. (Nearly everybody has read this one, right? If not, you should!) Pi tells his tale, and the interviewers do not believe him. I mean, it is a pretty unbelievable story. So Pi tells another story. He says that several people on the ship survived and one was the cook, who killed and ate the other passengers. We then learn that perhaps Pi is the tiger, for he is the sole survivor. This is where the allusion to Poe’s novel becomes pertinent, for cannibalism may actually explain Pi’s survival rather than the fantastic story of the tiger. Yet Martel takes both of these stories to a different level and ties them back to religion. The book makes some points about atheism and agnosticism, and says that when an atheist dies and “sees the light,” he or she will attribute it to the synapses in one’s brain firing as the body dies. An agnostic, upon dying and encountering “the light” would perhaps change opinions and say that they were wrong, for there is a God. This passage can then be applied to Pi’s story. Do you believe it, or do you believe the more logical explanation of his survival? It is an interesting way to talk about and think about belief. I do enjoy this book for the interesting story but also for the philosophical and religious musings. I liked it so much that I’ve read it twice. I would read it again, too. I also recently saw the movie. It was great! Ang Lee directed it, so some of the mystical and dream-like styling worked well with Pi’s time in the ocean and the mood of his story. It also followed the book closely, which always pleases me. The novel is a frame narrative, in which Pi tells his story, years later, to a journalist. The premise is that Pi’s story will make the journalist believe in God. I’m honestly not sure if another person’s story can necessarily (or always) convince others to believe. Sometimes such stories or testimonies can be inspiring. But we have sacred books and mythical traditions that have been passed on for thousands of generations and not everybody believes them. I’m sometimes moved by other’s stories and experiences, but I find that I’m most convinced and schooled by my own. I see life as a place for us all to journey, together but separately. We are all working toward becoming who we can best be, through experiences and studying and learning and growing. It is a natural process. Some of us encounter hard things. Some of us make choices that create conflict, and we learn “the hard way.” Some of us can look at history and not repeat it. No matter who you are, however, I think the greatest teacher is one’s own experiences. I’m not convinced that Pi could tell his story to everybody and prove something, like religion or the existence of God. However, I think that we can all draw conclusions from the sum of our experiences and that those conclusions may be what is best for us. It is a journey, we have agency, and we must learn for ourselves. In the end, it is clear that Pi believes, but is his story (or stories) convincing? Which one do you believe? Glad you posted this! I started reading this and put it down until a later date, ’cause I could tell I would want to read it when I could give it my full attention for more than an hour or so in the evening, and then I’ve not yet returned to it. Your review makes me want to allot the time to read it now!! Thanks again for giving me a bit more detail. I admit when I initially started hearing about it I was fearful it was a propaganda/”recruitment” tool for Christianity, but apparently not…now I’m even more curious!! Rather than giving too much away, I would say your review made me even more curious while providing a better background. Thanks again. This book is on my TBR list but after reading this post I think I’m going to have to bump it up higher on my pile. It sounds like an amazing read that really leaves you thinking at the end. Yes, it definitely leaves you thinking! Do move it up, and I hope I didn’t spoil it for you. I’d like to read the book but I haven’t read it yet. I know the story of Pi though as I saw the movie at the beginning of this year. It was amazing! The CGI is absolutely stunning and it’s a very beautiful, moving film. The ending is very thought-provoking. I must read the book! Yes, do read it! But I agree that the movie was wonderful. You are right about the CGI. Life of Pi is unfortunately a plagiarism of a book by a famous Brazilian named Moacir SCLIAR writings. He wrote max and the cats in 1980, including the cover of the book was plagiarized. You can read more in several Brazilian sites. Published in 1980 and translated in 1990, Max and the Cats comprises some tales. The main story tells of a boy who flees Nazi Germany on a ship towards Brazil. After a shipwreck, the boy is saved in a boat with a jaguar. In the story, the jaguar is the symbol of the military dictatorship, an animal difficult to understand and could be violent at any time to satisfy your needs. In some cases I believe that one book can be inspirational for one history, in this case it’s just a copy. I recomend that you read the original, brazilian version. Thanks, Patricia! What a downer that it is “plagiarized.” I’ve actually run into that in a lot of literature, as the same themes and plots attract us. I’ll have to look more into that. So, it isn’t word-for-word stolen, right? Just the similar story and idea? Yes Emily, I believe that the essency of “Life of Pi” was extract of Moacir’s book. This also not mean that “life of Pi” its a bad book, but the story of a boy on a boat with a tiger and the tiger fact symbolize a fear or anxiety of the character was taken from the book of Moacir SCLIAR. Follow a link that explain more about it, I believe that you can read with Google translate. I read Life of Pi quite awhile ago and this is the first time I’ve heard of this. I will have to look ino the Brazil story-so long as it’s translated in English. Thanks for sharing! I think the difference in being agnostic and atheist is interesting. I’m not sure what my label would be – neither of those is right – but generally I believe everyone with any sort of faith, whether it’s in a high power, or science, or nature, or our own innate goodness, is correct about some small piece of a very big puzzle. Bring them all together, and we might be onto something – even if it’s just an understanding that the universe is immense and wonderful. I’m rambling, but I also loved this book! I love the puzzle metaphor. I agree. I think we all have experiences and beliefs and goodness that can be brought together for even more understanding of truth and the universe. Thanks for the comment! Great review! I’m planning to read the book now; whereas before I’d just seen the movie. Sounds worth it! It is worth reading for sure! While I tend to believe the more logical scenario, I prefer that of Richard Parker (the tiger). The same goes for my spiritual beliefs, as well. I don’t personally believe in a deity, but I of course have no way of knowing for certain. Religions and belief fascinate me, though, and I would think it wonderful if it turns out that a god actually does exist. 🙂 Everything just going black at the end would be so… anticlimactic. Yes, definitely anticlimactic! I am like you. I believe the logical scenario, but I want to believe that he really survived on a boat with a tiger. That is a cooler story! My son read this book and adored it. I haven’t yet picked it up but he keeps telling me I should. I know, it’s hard to admit it but the kid has taste! I would like to think it comes from Mom. Thanks for your review, I too love this book and enjoy re-reading it. Thanks especially for the Edgar Allen Poe connection that I had not heard before. Like a religious text, everyone seems to have their own interpretation of it, each reasonably consistent with the story but inconsistent with other interpretations. That I think is it’s best achievement, it allows different interpretations without necessarily leaving the reader annoyed with too much ambiguity. I like what you are saying about interpretation. We all view things differently and what we bring to a text can be just as important or telling as what the text actually says. I think this book demonstrates that well, as you point out. I’m glad to know that you liked it too! I loved the book when I read it a long time ago and it was in part because I read it somehow thinking it was an actual true story. So when I got to the end, I was a bit confused. After I got over the weirdness of how I could have thought it was true, I’ve still told people about it and promoted it mostly because I loved the boy’s ernestness (is that a word?) toward multiple religions. I also recently watched the movie and thought it was beautiful. I don’t know if this line is in the book, but when I watched it on the movie, it was SO moving to me. Pi is recounting the two story lines to the journalist at the end and saying, “You can believe whatever story works for you … and so it is with God.” Religion can mean so many different things to everybody and – who knows – maybe we’re all right. It’s a lot to think about (especially coming from a religion that claims to be THE only right one). Yes! I’m totally with you on that. I think all religions have goodness and truth and we can certainly learn from each other. I had a similar conversation with my bishop a few days ago about reading outside of the “standard” works and he thought that was great and that we can learn from other religions and other texts. We also talked about how culture becomes such a huge factor in religious life, and it is hard to change religions or to give up culture for more truth. Anyway, I completely agree and I love your comment, Martha! I think this is a wonderful book and worthy of its review! Life of Pi was a fun read, and I’m so happy to see a ton of positive reviews. Me too! It is such a great book and so fun to connect with people over it. Faith has great power. It can heal, invigorate and help you achieve goals which would otherwise sound impossible. You are right that the book -as well as the movie – presents this concept very forcefully. I happen to live in Pondicherry and can readily identify with Pi’s childhood memories. How neat! Does the book describe Pondicherry authentically? Is it recognizable to you? Yes, and I agree with you on faith. It is powerful. Thanks, Emily. By and large, yes, the book depicts the old time Pondicherry rather well. However, with all the technical razmatazz, the movie somehow does not! I haven’t read the book but I did watch the movie and although I felt it inspirational I wasn’t quite sure how it spoke to me till I read your review. I especially like the part where you mentioned as to how we can all draw conclusions from the sum of our own experiences. I think for me, that was the most powerful message in Life of Pi. Thanks a lot for this review! I saw this again at a book sale recently and regrettably passed it up a second time. I did see the movie, and although it was stunning and enjoyable, it didn’t move me the way I had expected it to…I am sure it is because it was a movie and not the book, as movies simply can’t convey the full complexity and nuance that books can. I’m glad I saw your review as I will definitely put this on my to-read list now! Yes, do read it! The movie is good, but there’s no way for it to contain all of the information that the book does. I hope you like it as much as I did. This book was not on my TBR list, but you wrote such a compelling review that I am adding it to my list. Thanks. How cool! What a neat lesson idea. You sound like a fabulous teacher. I love that you had the students learn allegory with it, but also debate the merits of the book versus the movie. I’m glad they sided with the book, but as you said, the movie is good too. So, first I would like to say that you’ve done a great job with your review! Second, I’d like to go back to the second paragraph and remark on how wonderful it would be if we could all realize how special each and every religion can be. To me is not about which is right or wrong, but which helps us to grow as a person. Life is to short to trouble ourselves with whether what we believe is right or wrong, instead, we should accept that we believe what we do because it not only helps us to be better people, but inspires us to better people to others :). Thanks for the post! Thank you! I am glad you enjoyed it and it is nice to have your voice added to the discussion. I loved Life of Pi for the questions it raised about religion and human behavior. Great review! Thank you! And thanks for posting that line about “hard to believe.” There is so much that is hard to believe, and I guess because of that, the book does teach, or at least demonstrate, faith. Thanks for adding that to the discussion! I read this years ago and honestly I’d forgotten there was any other story than the tiger in the boat bit. I also did not remember the theological interplay. The mind is a funny thing. This is why I buy used & then keep most of my books, because my mind is a ridiculous sieve, and I can now go back and relearn what I did not the first time around. I remember loving the book and raving about it to all my friends. I’ll definitely be reading this again with your thoughtful post in mind. I can’t wait to queue the movie also. I always think that the book is about the nature of belief rather than which version of the ‘truth’ we as readers choose to believe. The challenge to decide what you think happened at the end is a delightful twist and really well done I think. I read an interview with Yann Martel about the movie when he was saying he thought the basic difference is that words are better at describing emotions and ideas than things. So in the book it says ‘the ship sank’ wheras the movie makes significantly more of that. At the same time, the book is much better at getting inside Pi’s mind than the film could ever be. Great insights! Yes, it is about the nature of belief for sure. I like that more nuanced description of it. I like what you say about the movie versus the book too. I think that could apply to every instance of books being made into movies. Reblogged this on accio love.. I read the book and then I liked the movie so much, I went to see it three times. I think the story about cannibalism and murder is the true story. But at the end Pi asks–which one would you rather believe? Definitely the story with the tiger. Agreed! I’d rather believe it was the tiger too. Pingback: On My Bookshelf, No. 9 | The Bookshelf of Emily J.